Lunarfurniture.com – Selection of furniture to fill the House is an important thing to be done with caution. If you have a specific concept in your residence, furniture used must be in accordance with the concept of a particular décor. In a minimalist house furniture, the selection needs to be tailored to the concept is elegant and simple. One of the most important furniture for any home is the wardrobe. As a place to store the shirts from the occupant of the House, the wardrobe has a very important role in a home. Not only in terms of function, the design of a garment could also affect the design of the House itself. Therefore, a minimalist wardrobe is the most appropriate design to support the interior design of your home. Spaces that are directly influenced by the design of the wardrobe is the bedroom. In addition to the cabinet design, the other thing to note is it’s placement, especially when the size of the bedroom is not too broad. Along with the growing popularity of minimalist concept, now numerous furniture manufacturers that make wardrobe with a minimalist design. To select the appropriate wardrobe with minimalist House, you can choose it in terms of material, colour, model, size and function. The appropriate wardrobe with a minimalist concept is that size is not too large. Generally, people prefer cabinets with large size in order to be able to load more clothes regardless of the size of the room. To solve the problem, wardrobe with a minimalist design created by accentuating it’s functionality. With size tends to be Petite, you can choose the wardrobe with effective and efficient design. Four-door wardrobe with very spatial intelligent you can choose. Like for example, the cabinets which provides your own space for the clothes folded and hung in hanger, as well as a special space for storing personal items. The primary key of the minimalist designed wardrobe is the placement of the space that corresponds to the function of each. 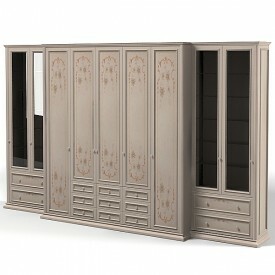 In addition to choosing from the function of the wardrobes, the wardrobes’ design also needs to be considered, i.e. the one that does not have too much detail and tend to be simple. In order to be used for a long time, made from teak cabinets are more advisable. However, if the budget is not sufficient, a minimalist with other types of material can be used.